Butlers Catering ensure there is always welcoming fare on offer. Top quality catering is an integral part of a successful golf club. Whether it is meal after a game, a casual visit to the clubhouse or a formal social function, good food and drink will make the experience more enjoyable. We are very proud of the service and food our caterers offer. They are renowned for their quality offerings with comprehensive menus supplemented by mouthwatering daily and evening specials. The kitchen will cater for your every need, from a large selection of freshly prepared light snacks to waitress served fine dining meals. 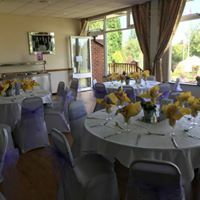 The vibrant atmosphere in the clubhouse quality catering and excellent bar service encourage members and visitors to make full use of the facilities. We hold regular dining events which are open to Members, Guests and Visitors. There is a Sunday Lunch most Sundays and Friday Fish Suppers every month.